Rome is known as the Eternal City for good reason. One of the city’s ancient marvels is the Egyptian obelisk in Saint Peter’s Square, a block of marble as tall as a tree that weighs 330 tons. Erected as a monument to Pharaoh in 1850 BC, it stood watch over the whole of Egyptian history, the world’s longest-reigning empire. The obelisk existed there when Abraham was called and when Moses led the Israelites from slavery into freedom, thousands of years ago. At the time of Christ, after the magi visited, the Roman Emperor Caligula claimed the obelisk to display the supremacy of the Roman Empire, the largest empire in human history. At its base Saint Peter was martyred and countless Christians shed their blood. Then the barbarians invaded and by the year 1,000 the tower had been toppled and remained broken and covered with ivy for centuries. Eventually the Church rebuilt the monument and today it stands in Saint Peter’s Square. No longer is it a sign of the vanquished realms of Egypt and Rome. Now it serves the universal kingdom, older and vaster than any before it: the eternal kingdom of God. Taken together, the Scripture readings for Advent present a panorama of the universality of the Gospel. The striking images found in Isaiah and Matthew reveal the awesome reality so plainly stated by Saint Paul: “But now in Christ Jesus you who once were far off have been brought near by the blood of Christ. For He Himself is our peace, who has made us both one and has broken down in His flesh the dividing wall of hostility by abolishing the law of commandments expressed in ordinances, that He might create in Himself one new man in place of the two, so making peace, and might reconcile us both to God in one Body through the cross, thereby killing the hostility” (Ephesians 2:13-16). All nations are invited to sing God’s praises and to worship the Messiah with the gift of their lives. “Every nation on earth will adore You,” (Psalm 72:11). Our hearts ring with this constant refrain! Epiphany is the introduction of Jesus to the world. In the Church, this great feast celebrates the adoration of the Messiah by the oriental magi. These magi are representatives of the world’s many pagan cults. Their presence acknowledges that universality of Christ: the Star of David shines for all. Their visit anticipates the coming of the New Covenant, wherein the Gentiles are reconciled with the Deity through the saving work of the Incarnate Word. Scripture contains numerous prophecies which foretell the conversion of the Gentiles (cf. Isaiah 60:6, Psalm 72:10-11). The messiah is not simply the Son of David, but the Son of Man, “the true Light, which enlightens everyone” (John 1:9). His cosmic kingdom extends breaks the bounds of time and space. Even the great Egyptian obelisk fails to do it justice. To the average observer, the Church appears physically impressive—and indeed she is. At the start of the third millennium, she holds against her breasts the souls of 1.2 billion believers. This enormous host of faithful is shepherded by 5,000 bishops, half a million priests, and another half million deacons and religious. The Church is divided into 3,000 dioceses, which in turn yield hundreds of thousands of parishes. That’s not to mention the schools and hospitals, cemeteries and orphanages. And all of this from the Seed of Abraham, a lowly Semite of no rank or class. This bounty can be explained in one word: Jesus. The fruits of the Church are only legitimate so long as they grow upon the Vine, the Wisdom of God whose life, death, and resurrection gives us eternal participation in the Divine nature. The Church is not in the real-estate business; she does not serve interests outside her mission, which is the continual proclamation of the Living Word, so that men and women might discover that they are known by and can enter into union with the Creator of their souls, the Artisan of their universe. Saint Paul makes this abundantly clear, writing that he has received the task of revealing the mystery of salvation to everyone he meets: “You have heard of the stewardship of God’s grace that was given to me for your benefit, namely, that the mystery was made known to me by revelation” (Ephesians 3:2-3a). Ephesians is Paul’s great hymn to the universal Church. It appears in the lectionary more times than any other apostolic writing, including on the feast of Epiphany. In this letter, Paul simplifies salvation by categorizing believers as either Jews or Gentiles. The Jews are the Chosen People, God’s first children, through whom the world received the messiah. To the Gentiles, Christ in turn extends the ancient offer of salvation promised though the ages and detailed in the pages of Sacred Scripture. This promise of redemption is not new: humanity has awaited its fulfillment since before the Romans conquered the Mediterranean, since before Pharaoh’s obelisk was erected, since before the magi charted the stars. The events of Christ’s life are the perennial themes of human religion. They run like scarlet thread through ancient mythology. The incarnation, the crucifixion, the resurrection—these images haunt the human soul for good reason. They are our deepest desires, our oldest hopes! With the birth of Jesus, the mystery of the kingdom has been completely revealed, to Gentiles and Jews alike. 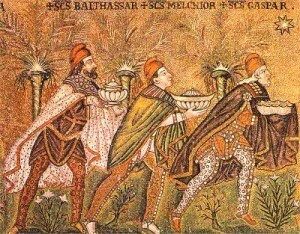 The magi represent all nations, thus teaching us that the Church extends through all time and space. In the nineteenth century, the world knew the phrase, “The sun never sets on the British Empire,” for the Union Jack fluttered in every corner of the globe. Today, the obelisk in Rome has been restored; burnished in bronze and fixed with a piece of the True Cross; baptized as a monument to Christ our King, who reigns forever and ever.